The day started out with getting Sam and the boys ready to head out to their hunting lease. After we got them out the door, Bridget and I got ready to go to IHOP for breakfast. What a treat to eat out with my girl! We did our best to match (Bridget picked a black/white dress for her self and a black/white skirt for me), and we thoroughly enjoyed our time together. After breakfast we had to head back home to get my birthday cake made. (Raspberry filled vanilla cake...yum!) We worked on that, and then got the house cleaned up so that we would be ready to party when the guys got home. We also found time for a quick run to the end of the street and Bridget gave me a piano lesson...so sweet. I'm not sure I've ever had the birthday song sung to me so many times in one day. Jonah woke me up singing at 6:30, each of the kids sang individually and together, Brian texted me a song, Sam sang along to an interpretive dance on the fire place (eek!). One of my favorites was the video my mom sent of her dogs 'singing' to me. It cracked me up! Sam and the kids decided to take me to Jason's Deli for dinner because it is my favorite place to eat. We had a fun birthday dinner, including ice cream, of course! Then we stopped by Barnes and Noble so Jonah could spend the gift card he won from the library's summer reading program. He found a really fun balloon-animal book and will be learning how to make fun animals soon! After that we went home for presents and cake. The kids all picked out the sweetest things for me. Sam bought me a new set of pots and pans, and he had it hidden in the garage. I had to read the card in code and figure out where to go to find my gift, so that was fun! I was really surprised by that. What a thoughtful gift. Overall, it was a pretty great way to celebrate my birthday! I have the best family ever. Bridget mentioned her birthday wishes to Mr. Tuttle one day (during the planning/counting down days leading up to her birthday), and he offered to throw her a party at his ranch. Bridget invited Ella and McKellee and their siblings, and we all headed out there on a Sunday afternoon. 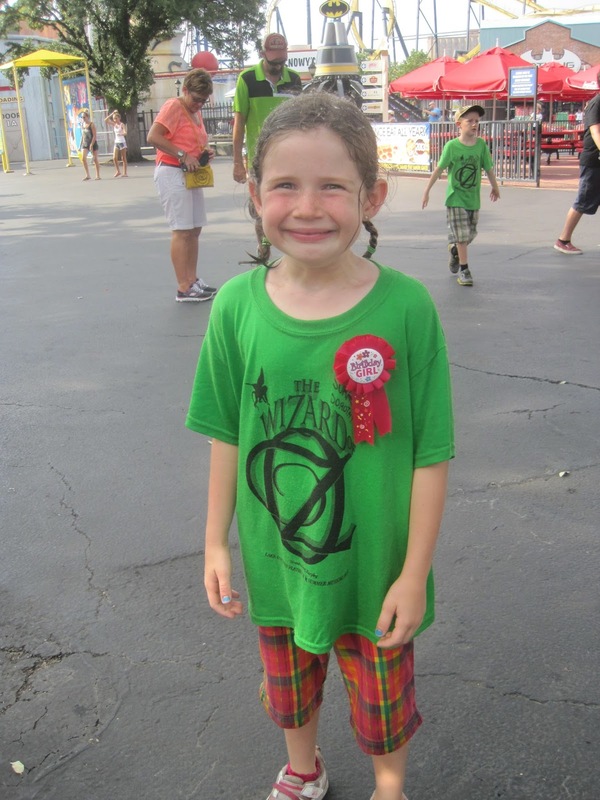 (We had to wait for the weekend after Bridget's birthday and the end of The Wizard of Oz). Mr. Tuttle had everything set up when we got there. We sat down to eat right away...he had grilled hotdogs for us all! After dinner we all dug into the cupcakes that we brought and the cookies that Mr. Tuttle brought. I think he might have brought 12 different kinds of cookies! Bridget hanging with her good buddy, Mr. Tuttle. After everyone had a bite to eat, it was time to head out for the scavenger hunt. Mr. Tuttle had hidden two big coolers full of candy for the kids to find. 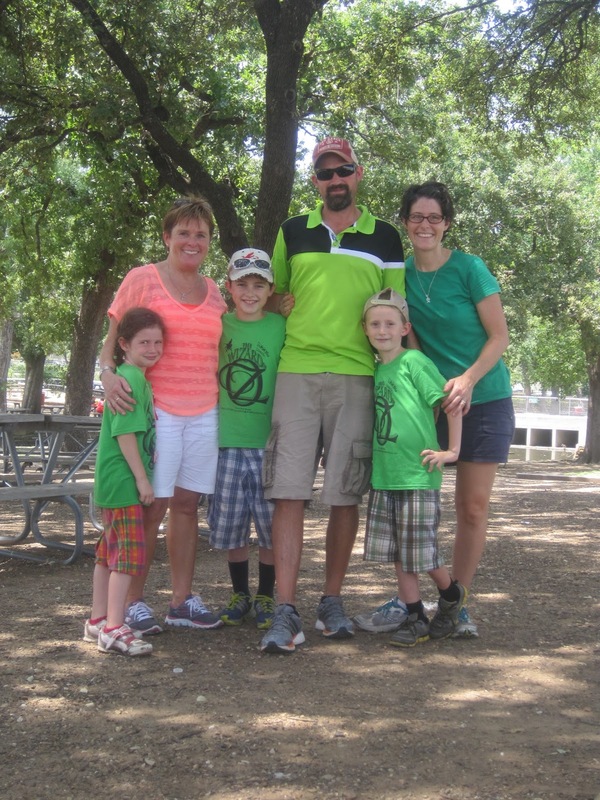 He split the kids up into two teams, and he and Mrs. Tuttle helped the them all follow some clues to find the candy. The kids were all pretty excited about the candy...that is, until they found the bottle with a note in it! There was actual, real treasure hidden out on Mr. Tuttle's ranch!!! The kids couldn't believe their luck! 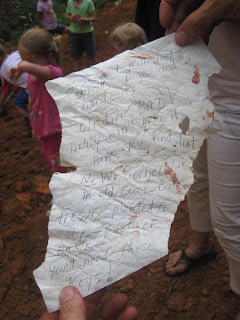 They gathered up the adults (who hadn't gone along on the scavenger hunt) and followed the directions on the note. They ended up in this abandoned area of the ranch. Luckily, Mr. Tuttle had loaded them up with rakes and shovels so they were able to search out the treasure. It had been buried there a long time! The boys did the heavy labor of digging. Bridget helped to unearth the treasure box. We couldn't find the keys to open up the treasure box, so Mr. Tuttle pulled his gun out to shoot off the lock! At the last minute, we decided to take it back to his workshop and use a screwdriver to take apart the hinges. The kids were all so anxious to see what might be in the box. Turns out there was a LOT of treasure in that box! Jewels, money, coins, knives...all sorts of fun treasures to sort through! The kids couldn't believe their luck! They had so much fun digging through the box and picking out their treasures. Mr. Tuttle suggested setting the treasure aside to split up another day and heading over to his lake for a swim. We all loaded up and headed down to the lake for a refreshing evening of swimming. The kids had a blast jumping and diving off of the platform that Mr. Tuttle has set up at his lake. He followed the swimming up with popsicles and even rewarded the kids for their crazy dives. The next day, all the kids came over so we could split up the treasure. 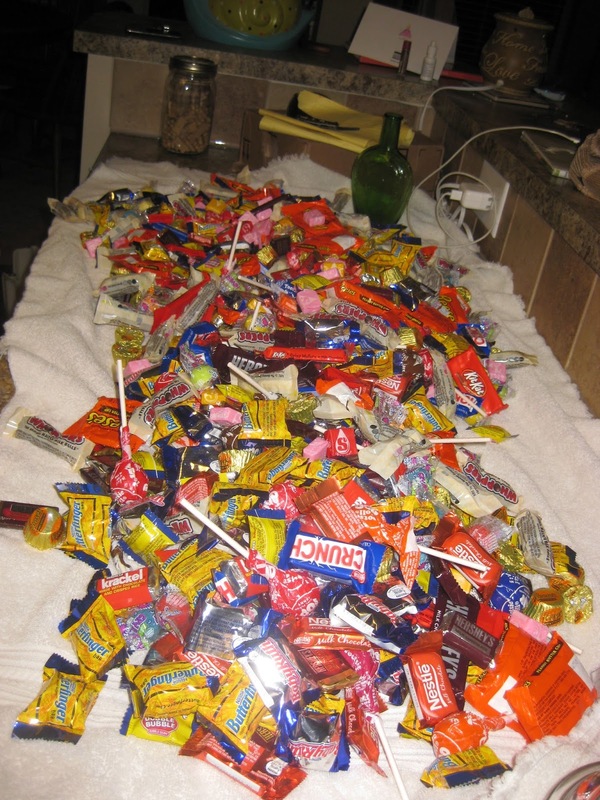 There was so much candy, we didn't even know what to do with it all! 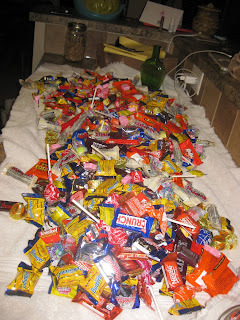 The kids had fun sorting it out and they even made a chart so they could see how many of each candy there was. All the kids ended up with money (somewhere upwards of $20 each!) and lots of treasures from the box. I think they all left with something fun. It was a pretty special birthday for a very special little girl! Happy Birthday Bridget Boo! We love you so very much! There was a lot of build-up to Bridget's birthday. Six is a pretty big number around here. Bridget was counting down the days for a LONG time leading up to her birthday. And she had big plans too. She wanted a party, of course. But she also wanted to go to Six Flags. And she REALLY wanted her Grandma to come to hang out for her birthday too. You know, if that wasn't all too much to ask. The day before her birthday, Bridget helped me make her cake. She had big plans for her cake too. Maybe a castle cake. With windows and a door and a flag on top? And it should be pink. Or purple. Maybe both? 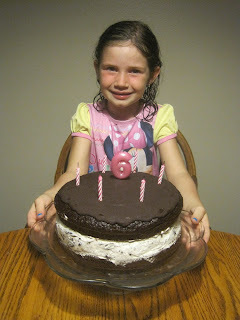 :) Since we've done the castle cake before, this year we opted for a fun giant-Oreo cake. Bridget is a great helper in the kitchen and she did all the baking. I just assembled the cake. The night before her birthday, we got Bridget and the kids all ready to go to Six Flags in the morning (clothes laid out, water bottles ready to go, snacks and lunch packed) and sent them off to bed. They knew I hadn't made it to the grocery store that day like I planned, so after telling everyone goodnight, I headed out to go to Walmart. I did go to Walmart, but I also ran by the airport to pick up my mom! She flew in at 10:00 that evening. We came home, where Sam had the tv on REALLY loud to mask any sounds we might make, and we visited a while before heading to bed. The next morning, the birthday girl made her way downstairs. After snuggling a few minutes on the couch, she wondered if she could maybe start opening her birthday presents. I said no, but that I had left one more gift up in the guest room and asked if she would want to run upstairs and get it. Of course she said yes! So Bridget quickly ran upstairs and into the guest room....only to find Grandma sleeping in the bed! She was so surprised! Jonah was sitting downstairs on the couch with me. When he heard Grandma say something, he looked at me and said, "Is that GRANDMA????" and then went running up to see her. It was such a fun surprise! We were all so glad that she could come, even if it was a really short trip. It was seriously a dream come true for Bridget. We had a fun breakfast and got ready to head out to Six Flags. It's possible that Bridget's smile didn't leave her face all day. The boys at Six Flags! Grandma and Bridget were roller coaster buddies. They like the same kind of rides...nothing scary or upside down. Henry and Sam were paired up (one or two upside down rides, but mostly not) and Jonah and I were buddies for all the crazy rides that he is tall enough to ride. One of the best things about Six Flags in the summer is they have lots of opportunities to cool off. Besides the 'wet' rides, they have misting stations scattered throughout the park. The park employees are all happy to fill our water bottles with ice and water any time we ask. It was 100 degrees that day, but I don't think it bothered any of us at all. Bridget is a great driver! This is always one of everyone's favorite rides. We finally made it home, exhausted after a long day in the sun. Everyone freshened up with a quick shower, and then we got to sing to Bridget and have a piece of cake. Bridget enjoyed her presents, but I think Sam might have been a little tired by this point. Ha! It takes a lot to recover from a full day of Six Flags, the surprise of having your grandma surprise everyone and show up to spend the day with you, turning SIX, having cake and opening presents! We took it easy the next day. Jonah was thrilled to show Grandma how much he has learned on the piano and was excited to give her a little lesson. Grandma had a fabulous manicure and pedicure, thanks to Bridget's new nail polish set. Bridget did my nails too, but I forgot to get a picture of it. They looked awesome. All too soon, it was time to take Grandma back to the airport. She was only able to stay until that afternoon, but we were so very grateful to have her come and visit! Just the girls. We do have some fun together!